CoBank recently released a new report that explored a variety of issues that will impact the U.S. rural economy in 2018. In addition, recent newspaper articles have discussed reports relating to the value of U.S. farmland. This update briefly highlights core points from the CoBank report, and also looks at the new information on farmland values. A new report from CoBank (“The Year Ahead: Forces that will shape the U.S. rural economy in 2018“) outlined ten areas of focus in assessing the year ahead, including a closer look at the U.S. farm economy; trade issues; and grain supply and biofuels. 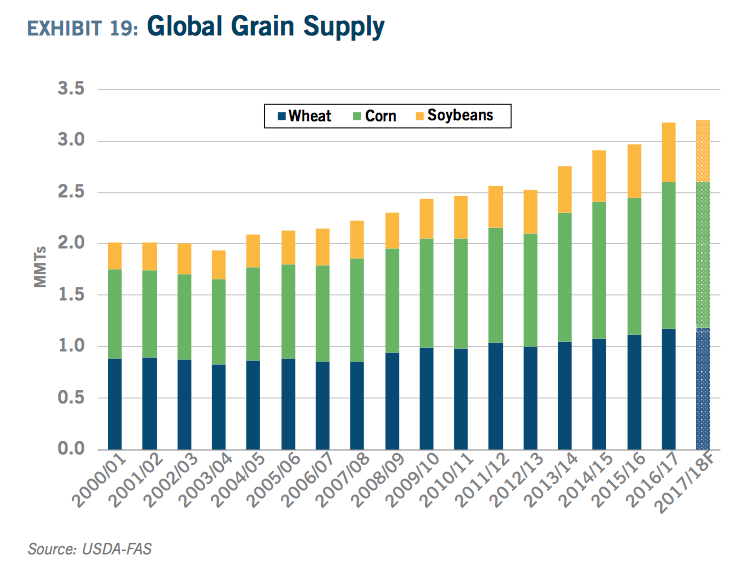 While addressing the U.S. farm economy, Tanner Ehmke indicated in the CoBank report that, “Farmers are bracing for another year of belt tightening as commodity surpluses around the globe continue to depress prices and sap farmers of working capital. While net farm income improved slightly in 2017 thanks to the livestock sector, farm financial stress will remain a common theme across the countryside. Debt loads among farmers continue to climb as they struggle to cover relatively high production costs amid anemic commodity prices. Ag retailers and cooperatives are also feeling the strain, keeping the topic of mergers and acquisitions on the table in co-op board rooms. CoBank Knowledge Exchange Report- The Year Ahead: Forces That Will Shape the U.S. Rural Economy in 2018 (January 2018). 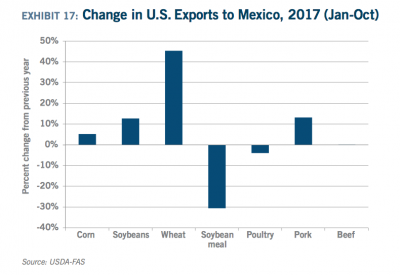 “Roughly 20 percent of U.S. agricultural goods are exported, valued at $135 billion. Both the value and the share have marched higher over the years as the farm sector has become increasingly dependent on foreign markets for demand growth,” the report said. 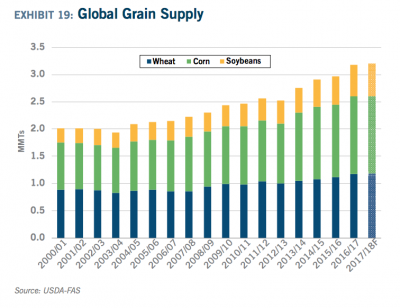 And while discussing grain supplies and issues associated with biofuels, Will Secor and Tanner Ehmke pointed out that, “Prices across both grain and ethanol sectors have been limited by supplies that have outpaced record or near-record demand. For both sectors, export growth will be critical to reducing surpluses. 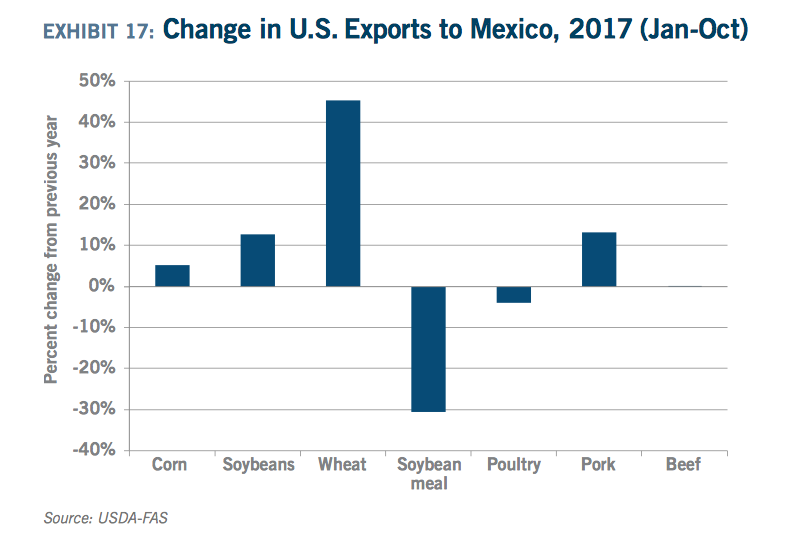 Domestic users offer limited upside for demand growth despite the current expansion in the U.S. livestock and biodiesel sectors. The World-Herald article added, “The report said prices for irrigated cropland in Nebraska averaged $9,000 an acre in 2017, down from $9,500 in 2016 and $10,000 in 2015. The average for high-quality Iowa farmland was $10,500 last year, up from $10,100 in 2016 and 2015. 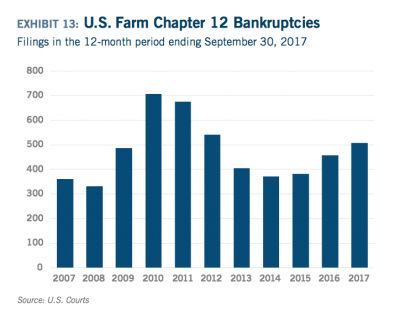 “Farmland Values Stabilize in 2017 in Grain Belt States.” Farm Credit Services of America (January 18, 2018). “Average farmland values were 1.8 percent higher over the past year, based on sales data and appraisals of 21 Iowa farms used as benchmarks by Farm Credit Services of America in Omaha. Despite the increase, Iowa’s benchmark farmland values are still nearly 13 percent lower than five years ago, due to declining corn, soybean and other commodity prices.